There is no more beautiful passage in Scripture and no more wonderful depiction of Mary than this account in Luke 1. Mary conceived of the Holy Spirit and, carrying the baby Jesus in her womb, visits her cousin, Elizabeth, who is also with child. When the two meet, John the Baptizer leaps in his mother’s womb—from being in the presence of Jesus, also still in Mary’s protective womb. What a story! What a meeting! What a miracle! God has chosen this woman to bear the Christ child, and in joyful response, Mary sings her song, the Magnificat. It is still a few days until Christmas, but even now we are mindful of the wonderful things God has done for us—for me. He gives us life, health, food, shelter—what we call “daily bread” in the Lord’s Prayer. But more, He gave Jesus Christ to be our Savior! And still God gives Himself to us, in Jesus—as we celebrate both His birth at Bethlehem and His coming to us in Word and Sacrament, the means of grace, as mentioned before. How do we respond to these gifts of grace? 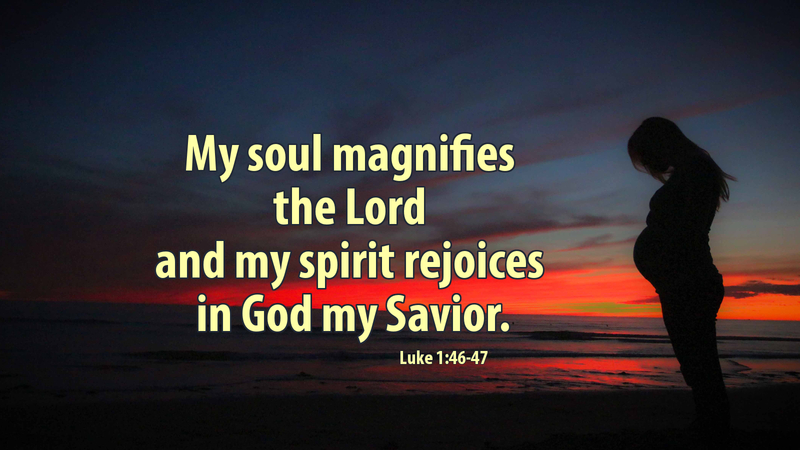 We could sing with Mary, “My soul now magnifies the Lord!” God has done marvelous things for us, regarding our low estate, raising us up, giving us His only Son. How blessed are we, with Mary, that we are called to receive Christ, and bear Christ as a loving gift for the world! Prayer: Lord God, our souls magnify you, singing your praise, giving thanks for your mercy and loving-kindness, through Jesus Christ. Amen. Advent Action: Read the account of the Nativity of our Lord, Luke 2:1-20. People tend to be more generous during Christmas time. We go about life with a little more spring in our step and smile on our face. But, why do we not carry that over into the New Year? We are told to repay evil with kindness, but do we do that as well? Christ is our gift from God, we are co-heirs with Him. I love Christmas and everything it brings. But, I also see the other side. Are we Ebeneezer or Bob Cratchet? Are we loving or just bah humbug?